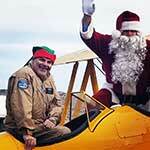 Your airport hosted over 175 of our neighbors who had a chance to meet Santa and experience a little aviation. Beginning on Thursday, November 8, 2018 a Marine Air/Ground unit will flow into the Reno-Stead Airport to conduct some pre-deployment training. Click the title to Read More Detail. Runway 8-26 will be closed, Runway 14-32 will have a restriction part of the day and Taxiway A centerline will be repainted. Read more here, Check NOTAMS and listen to the AWOS Notifications! From Mike Scott: I want everyone to know that I think it is awesome how our WHOLE Stead Airport Family pulled together to make our Runway Opening/Commemorative Brick Ceremony an incredible success. Runway 8-26 is Officially OPEN! Runway 8/26 is open for day/night operations as of 3:40 pm Friday, October 19, 2018. On Friday, October 12, 2018 Runway 14/32 is not available full length so we can do final lighting work in the runway intersection area from 7:00 am until 5:00 pm. Drone ops will be flying off of Runway 8/26 between A2 and A3 on Tuesday, October 9 to Friday October 12 between 9:00 am and 4:00 pm. Back-up Generator Out of Service – click on title to learn more. There will be drone flying activity on Tuesday, October 2nd from 0800 – 1500 on the ramp in front of the Grand Stand Area and in other areas the rest of the week. Click on the title to learn more. As I indicated on Monday, September 17, we have some restrictions on Runway 14/32 and TWY A for the next few days.